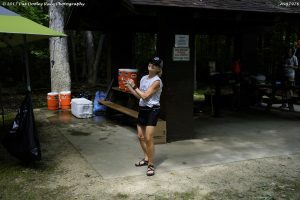 Mike took over as an aid station captain in 2012, the year after he ran Burning River. We have a great group of volunteers who year-after-year come back for more. Is there a theme at your aid station? We never have had a theme other than music and movement. Move the runners in and out ASAP. I “run” a loose ship with an emphasis on fun and keeping the runners minds off of their task at hand. CTC embodies the true depths of what makes the sport of triathlon so fulfilling: challenging yourself, overcoming obstacles, recognizing your full potential; shattering barriers, and learning about the depth of your own personal strength. Why volunteer at Burning River? To give back to the community. As competitors we recognize and understand how vital volunteers are for us to be successful at races, so we pay it forward to others. To see the community come together to support each other is amazing. 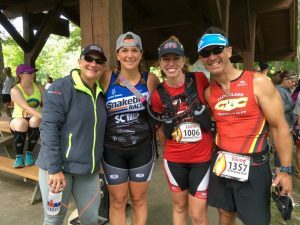 What can participants expect from your aid station? We are like a family picnic that you are crashing, so don’t feel bad if we chase you out if you linger too long. Last year we had one runner stay long enough that he was wearing a bathrobe as he left our station! 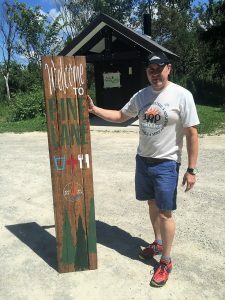 What are the rules at your aid station? Keep the snack tables stocked, and keep putting a smile on every runners face that comes in to our little station! Check out part three of this article for more information about volunteers that will help be there to lean on.